Ohio samplers have come to the forefront in recent years since the exhibit at the Ohio Decorative Arts Center in 2002 and the publication of the catalog by curator Sue Studebaker along with her later book entitled Ohio Is My Dwelling Place: Schoolgirl Embroideries 1800-1850. Hamilton County, named for Alexander Hamilton, and established in 1790 was the second county to be carved out of the Northwest Territory and pre-dated Ohio statehood by over 12 years. Development in this new county took place mainly in Cincinnati, which soon became a booming River Town known as the Queen City of the West. As part of the Symmes Purchase, also known as the Miami Purchase, Mill Creek Township in SW Ohio comprised what is now Hamilton, Butler and Warren Counties. Situated between the Great and Little Miami Rivers and bisected by Mill Creek after which it was named, Mill Creek Township became the home of John Butler and his wife Elizabeth. Originally from Salem, New Jersey, they removed to Ohio sometime between 1805 and 1807. Their first two children, Mary Ann (our samplermaker), was born in 1803 in Salem, New Jersey as well as her brother Josiah, born in 1805. Their other two children, Sarah Ann and Jane were both born in Cincinnati, Ohio. Mary Ann married William M. Nelson in 1825 and they had 7 children, two of whom were born in Ohio and the other 5 born in Indiana. The 1850 census lists William's occupation as a farmer but in the 1860 census he is listed as a Christian Clergyman and living in Iowa. By 1880 Mary Ann was living with her youngest daughter, Sarah Hadlock in Logansport, Cass, Indiana, and in going through the cemetery records we find Mary Ann buried in the Hahn Cemetery (Anoka) in Washington Twp., Cass Co., having died 23 Dec 1885. Westward migration was expansive during these times and records of the migration were sometimes dismal, but the fact is that the Westward movement was in full flux, the records of these migrations are most treasured. These people are our anchor to the earth where we are now. They are long gone but certainly not forgotten for many who choose to preserve this heritage in their collecting of important documents of the life on the frontier at that time. Mary Ann's sampler is a link to that other time. It is beautifully executed in silk on linen. 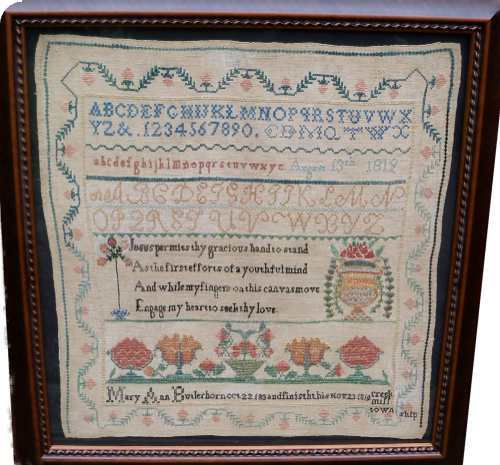 She has included two dates on her sampler, the first being August 13, 1819, presumably when she started work on the sampler. She states that she finished the sampler on November 23, 1819 in Mill Creek Township which is in Hamilton County, Ohio. 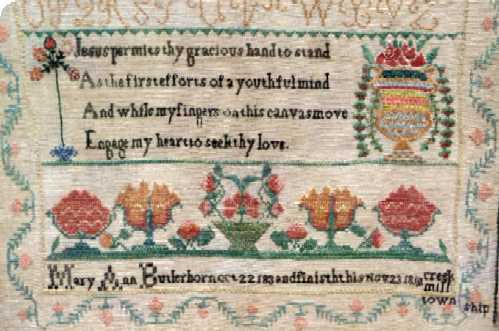 What is particularly interesting to note is the fact that the motifs Mary Ann used on her sampler are unlike any others that have been documented on other Hamilton County samplers. In addition, the fact that she names Mill Creek Township makes this example exceedingly rare. The sampler is in excellent condition and has been conservation mounted on acid free to preserve and protect. Size is 17" x 18-1/2" (sight) and 21-1/2" x 23-1/2" framed.